Shopping for the best SSD drive for iMac desktops? Breathe new life into an aging iMac computer with these recommendations for the best iMac SSD drive upgrade options. The current version of Apple's iMac desktop computer is a razor thin design. Its suprisingly small logic board and other component size reductions made an ultra-slim aluminum iMac possible. The drives changed form-factor from the thick, bulky 3.5" standard hard drive sizes down to laptop size SATA III 2.5" drives. The transition to a smaller hard drive also became feasible as laptop drive capacities progressed to 1 Terabyte, 1.5TB and 2TB capacities and beyond. Any modern 7mm-9mm modern SATA III 2.5 inch Mac compatible solid-state drive is suitible for a drop-in replacement or drive upgrade in these particular Macs. No drive converter / adapter is required. However, disassembly is delcate and tricky. It requires the right tools and techniques to remove and replace the front display glass correctly. There's also a thermal sensor that's involved to keep the fans running at appropriate speeds. Higher end and built-to-order Apple iMacs may already incorporate an onboard SSD module (512 Gigabyte or 1 Terabyte) pre-configured as a Fusion drive for optimal performance in tandem with Apple's internal hard drive. As Apple transitioned from white plastic to slimmer iMac designs, they moved to an all metal enclosure. The drive interface advanced to 6GBps SATA III. You'll be able to fully leverage the affordable and very fast off-the-shelf SSD drives drives currently on the market. Access to the iMac's 3.5 inch drive bay now involved removing the front LCD display glass, ideally done gingerly and armed with special suction-cups to properly lift the glass away without undue stress or pressure on any one side or corner. OWC Technologies provides a range of all-in-one upgrade toolkits for all aluminum and glass-front iMacs made after 2008. A 3.5" to 2.5" SATA converter / adapter bracket may needed, but adds only $15-$25 to a solid-state iMac drive upgrade purchase. The original G5 iMac - the thick, white plastic model was the first iMac to support (initially) a SATA I hard drive and can benefit greatly from a readily available, low-cost value SSD drive when paired with a 2.5" to 3.5" adapter or drive converter. Though limited to running OSX 10.5.x there's still a fair amount of them in use. With just 3 screws to loosen along the bottom of the iMac, removing the back panel is a very easy task, and the drive itself is then readily accessible and removable in just a few minutes. Since the Read/Write speeds of any modern SSD can vastly outperform the SATA I or SATA II interface, you needn't purchase a state-of-the-art SSD who's performance would be limited by the slower (but backward compatible anyways) interface. Later incarnations of the plastic white iMacs incorporated Intel CPU processors and Apple iSight web camera. Changes to the interior included metal shielding that was covered with foil tape shielding making upgrades of the SATA II 3.5 mechanical drive still possible but added more time-consuming, painstaking dissassembly steps to get at it. The swivel-necked LCD display model of G4 iMac computers (like all earlier iMac models) used an IDE-Parallel ATA hard drive. An iMac G4 SSD can significantly benefit from a solid-state drive upgrade. Since there's no full-size 3.5" PATA-IDE SSD's on the market, conversion of a 2.5" IDE SSD to 3.5” is needed with a special pinout adapter and mounting bracket. Transcend, SiliconPower and KingSpec currently sell 2.5" IDE solid-state drives. There is also the prospect of using an external FireWire 400 drive enclosure with an SSD mechanism inside used as a faster startup disk for a LCD G4 iMac. On the last generation of G4 iMac's of 1Ghz or higher - Apple transitioned to USB 2.0 ports. Perhaps a very-fast, top-performing USB flash drive could be used as a boot drive that would outperform the internal Ultra ATA/100 hard drives. The very first iMac computer was certainly a game-changer in the personal computer industry and a critical linchpin in Apple's turnaround to save the Macintosh from obscurity. 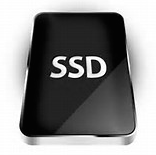 There's not much demand for IDE/Parallel ATA solid-state drives, but they're available. A Slot-Load DV iMac SSD external FireWire boot drive is a possibility on those systems that have a FireWire 400 port. Might be something an antique iMac collector hobbyist might want to try. Here we present some insights and tips for those with and aging or recent Apple iMac desktop computer looking to boost their overall system performance with an Apple compatible solid-state drive upgrade. Although many desktop iMac models are long obsolete, there's ways to leverage flash-memory storage technology on all of them using various internal or external SSD drive options. We cover some of the basic iMac models over the years. Check out EveryMac's detailed system specs of iMac models over the years for more detailed insights.